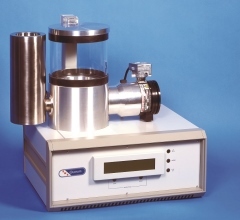 The EMS 750 Freeze Dryer operates at rotary pump vacuum using a 'Peltier' Thermoelectric stage, with drying temperatures of the order of -60°C, with back-up water cooling at a nominal 15°C. Both the Temperature and the Timer can be pre-selected, and the drying cycle will be completed automatically. Provision is made at the end of the drying cycle to allow the specimen to assume room temperature, or be subsequently warmed prior to embedding. Disposable desiccant containers are located in the preparation chamber to enhance the water vapor removal, and with a suitable container, the vacuumchamber can be utilized to prepare liquid nitrogen 'slush' for fast freezing. Convenient to use cold stage. Accurate temperature and time monitoring and control. For more information on Freeze Drying, please see Freeze Drying Principles. The EMS 775 Turbo Freeze Dryer operates at temperatures down to -140°C and employs a Turbomolecular pumping unit, backed by a Rotary Vacuum pump. 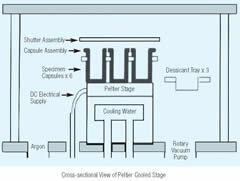 The lower temperatures are achieved by using a Liquid Nitrogen fed Cold Stage. The pre-frozen specimens are admitted into the cooled stage of the drying chamber through a vacuum gate valve which interfaces to the specimen transfer chamber. The system incorporates both Time and Temperature Control, and at the end of the drying period, the stage may be heated prior to specimen removal. The system also has facilities for purging with Nitrogen Gas. 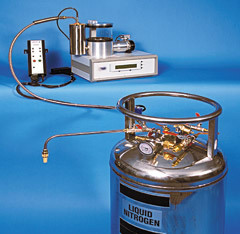 For extended drying periods, an auto top-up device can be provided as an option to continuously 'fill' the chamber's liquid nitrogen dewar. 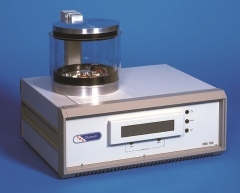 The option of a custom designed specimen freezing chamber to produce 'slushy' sub cooled liquid nitrogen is available which also interfaces to the specimen transfer chamber. The option for a carbon or sputter coating attachment without breaking vacuum is available. Programmable multi-segment sequence control with 10 times and 10 temperatures. Built-in penning head and gauge. Liquid Nitrogen fed cold stage. Vacuum gate valve to chamber. Accurate time and temperature monitoring. Cooling By liquid nitrogen conductive cooling from 1 liter dewar fitted to the chamber of the unit.